Case Studies | The New Dyna-Purge® D2 cut our post purge costs and downtime in half. The New Dyna-Purge® D2 cut our post purge costs and downtime in half. 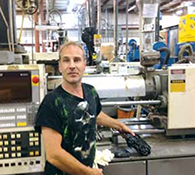 IMCO, Inc. of Rochester, NY is a custom injection molding company serving a wide array of customers. Among IMCO’s many products are clear polycarbonate lenses and window parts made with black polyester. The company operates molding presses ranging from 40 tons to 720 tons, including 22 Sumitomo machines with screw sizes ranging from 36 mm to 80 mm. Todd France, IMCO’s maintenance manager, noted they purge equipment when necessary, sometimes up to 4 times per week, for color changes or whenever there is any question of possible contamination. IMCO often uses materials such as nylon, polypropylene, PEI and PET that are among the more difficult resins to purge. 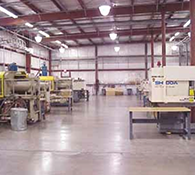 “We had been using Dyna-Purge® M with great success,” explained Todd France. “Now, after sampling New Dyna- Purge® D2, our purging results are even better.” Dyna-Purge introduced IMCO to New Dyna-Purge D2, providing a sample for testing and evaluation. Using New Dyna-Purge D2 allowed IMCO to complete a changeover in less than 10 minutes. Reduced scrap by 50% while transitioning to next production resin. Improved production capacity allows for new projects to be taken on. With 22 machines and frequent changeovers, New Dyna-Purge® D2 offers IMCO a more cost effective purging compound. New Dyna-Purge® D2 cuts machine downtime in half to help maintain high productivity.